(Nanowerk News) More than a third of all Americans – some 120 million people – will be diagnosed with cancer sometime during their lives. Because the odds of survival approach 90 percent if the disease is found early, scientists worldwide are on a quest to develop ways to detect and diagnose cancer early. Developing algorithms to visualize the prostate in real-time during robotic biopsy and radioactive seed-placement procedures. A precious metal long used for jewelry, gold may soon be considered precious for cancer detection and treatment. “Once you cut the size of gold down to a few nanometers, its properties change and it reacts with other elements, catalyzes reactions and interacts with light, which makes it valuable for medical applications,” says Mostafa El-Sayed, the Julius Brown Chair and Regents’ Professor in the Georgia Tech School of Chemistry and Biochemistry. While his wife was fighting breast cancer – a battle she ultimately lost – El-Sayed began reading journal articles about cancer research and realized that the properties of gold might make it useful for detecting and killing cancer cells. To investigate the possibility, he began collaborating with his son, Ivan El-Sayed, a head and neck cancer surgeon at the University of California, San Francisco. 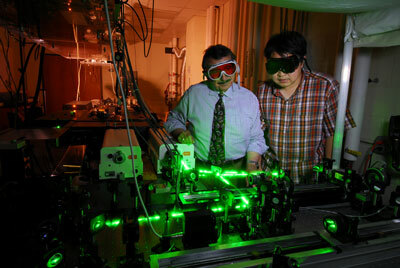 Mostafa El-Sayed (left) and Wei Qian shine laser light on cells with gold attached, allowing selective destruction of cancer cells. Mostafa El-Sayed designed nanometer-sized spheres of gold and attached them to antibodies targeting specific receptors on cancer cells, which were provided by his son. Using dark-field imaging, they were able to detect the cancer cells to which the antibodies had attached. They could see the cancer cell surfaces and distinguish them from healthy cells due to the strong scattering of light from the gold nanoparticles. Then the father-son team observed that these metal nanoparticles could also act as light-activated heaters for killing cancer cells. By shining visible laser light on cells, they were able to selectively destroy cancer cells with much lower power than was required to kill healthy cells. “During these experiments, we realized that gold nanoparticles have advantages over other nanostructures because they can achieve both diagnostics and therapy simultaneously,” notes Mostafa El-Sayed. After seeing the clinical potential of gold nanospheres on cells, the researchers conducted mouse experiments in collaboration with John McDonald, associate dean for biology program development at Georgia Tech, and Erin Dickerson, formerly a research scientist in McDonald’s laboratory. Xiaohua Huang, a postdoctoral fellow at Georgia Tech and Emory University, and graduate student Erik Dreaden also contributed to this research. By changing the shape of the nanospheres to cylindrical gold nanorods, the researchers were able to use near-infrared laser light to detect malignant tumors hidden more deeply under the skin and selectively destroy them without harming the healthy cells. Currently, research is being conducted to investigate the effects of gold nanoparticles on animals to clear the way for human clinical trials. “The unique ability to tune the gold nanoparticle properties by varying their size, shape, composition and medium has allowed us to design nanostructures geared for specific bio-applications,” explains Mostafa El-Sayed. This work was funded by grant number DE-FG02-97ER14799 from the U.S. Department of Energy (DOE). The content is solely the responsibility of the principal investigator and does not necessarily represent the official view of the DOE or the United States Government. Significant funding to support this research was also provided by the Julius Brown endowment to Georgia Tech. The explosive growth of genomic and proteomic data has ushered in a new era of molecular medicine in which cancer detection, diagnosis and treatment are tailored to each individual’s molecular profile. But this personalized medicine approach requires that researchers discover and link biomarkers – such as genes or proteins – to specific disease behaviors, such as the rate of tumor progression and different responses to treatments. Two new software programs that help address that challenge have recently earned silver-level compatibility certification from the National Cancer Institute’s cancer Biomedical Informatics Grid®, also known as caBIG®. Developed by May Dongmei Wang and her team in the Wallace H. Coulter Department of Biomedical Engineering at Georgia Tech and Emory University, the programs – caCORRECT and omniBio-Marker – remove noise and artifacts, and identify and validate biomarkers from microarray data. Funding to develop the programs was provided by the National Institutes of Health – primarily the Emory-Georgia Tech National Cancer Institute Center for Cancer Nanotechnology Excellence (CCNE), the Georgia Cancer Coalition, Microsoft Research and Hewlett-Packard. “Certification by caBIG means the tools can be easily used by everyone in the cancer community to improve approaches to cancer detection, diagnosis, treatment and prevention,” says Wang, an associate professor in the Coulter Department, a Georgia Cancer Coalition Distinguished Cancer Scholar and director of the CCNE biocomputing and bioinformatics core. caCORRECT – chip artifact CORRECTion – is a software program that improves the quality of collected microarray data, ultimately leading to improved biomarker selection. Because each microarray chip contains thousands of spots, it is easy for a few spots to become marred due to experimental variations by different laboratory technicians or errors that create scratches, edge effects and bubble effects on the data. caCORRECT removes the noise and artifacts from the data, while retaining high-quality genes on the array. The software can also effectively recover lost information that has been obscured by artifacts. In collaboration with Andrew N. Young, an associate professor in pathology and laboratory medicine at Emory University’s School of Medicine and clinical laboratory director at Grady Health System, Wang and graduate students Todd Stokes, Martin Ahrens and Richard Moffitt validated the caCORRECT software. The caBIG-certified omniBioMarker software identifies and validates biomarkers from high-throughput gene expression data. Candidate cancer biomarkers are typically genes expressed at different levels in cancer patients compared to healthy subjects. omniBioMarker searches these groups of patient data for genes with the highest potential for accurately determining whether a patient has cancer. However, because individual genes are not expressed independently, the software also identifies groups of genes that act in concert. Wang, Young and graduate student John Phan tested the ability of the software to identify biomarkers in clinical renal cancer microarray data. Since receiving caBIG silver-level compatibility certification for caCORRECT and omniBioMarker, Wang and her team have been working on getting two more software programs certified: Q-IHC and omniVisGrid. Microfluidic devices developed at Georgia Tech are enabling cancer researchers to collect and characterize tumor cells in a person’s bloodstream. Analyzing the quantity and diversity of the cancerous cells allows for early detection of tumors and cancer metastasis, as well as the monitoring of treatment. The analysis can also indicate the type of cancer, its aggressiveness and its receptiveness to particular treatments. “Microfluidic devices have advantages over many typical laboratory analysis systems like flow cytometry because they cost less, require only a small population of cells, demand less time and can be combined for multiple sequential analyses,” says Georgia Tech School of Electrical and Computer Engineering professor Bruno Frazier. Frazier and graduate student Youngdo Jung designed a microfluidic device that attracts and collects magnetically labeled cells into a center channel while allowing untagged cells to travel along outer channels. To test the device with cancer cells, they teamed with Emory University researchers Lily Yang, an associate professor of surgical oncology research; Georgia Chen, an associate professor of hematology and oncology; and Dong Shin, a professor of hematology and oncology. Because the proteins located on the surfaces of cancer and normal cells are different, the researchers selectively targeted the proteins on the cancer cell surfaces and tagged them with magnetic nanoparticles. In experiments, the researchers were able to collect 86 percent of the tagged cancer cells in the center outlet and 95 percent of the non-tagged red blood and white blood cells in the side outlet, with a flow rate of 100 microliters per hour. Excited with the experimental results, Frazier’s team combined the microseparator with a downstream impedance spectroscopy microsystem, which traps a single cell in an analysis cavity and measures its electrical impedance. “This impedance spectroscopy system allows us to determine the heterogeneity of a tumor, including the percentages of normal cells and different stage cancer cells, which is information that can be used to create a personalized treatment regimen,” explains Frazier. In experiments with normal and cancerous breast cells, the researchers observed significant differences in the magnitude and phase of the impedance signal, enabling them to easily classify the cells. The technique can distinguish normal human breast tissue cells, early-stage breast cancer cells, invasive breast cancer cells and metastasized breast cancer cells. Since completing the cellular experiments, the Georgia Tech and Emory researchers have begun testing the microsystems with blood and tissue samples from breast and head/neck cancer animal models. “We believe that the microfluidic devices we’ve built will eventually play a key role in numerous aspects of cancer diagnosis and treatment, including detecting and evaluating metastatic disease, selecting and individualizing initial surgical and medical therapies, monitoring disease progression and understanding the fundamental biology of metastasis,” notes Frazier. This work was funded by grant number ES10846 from the National Institute of Environmental Health Sciences (NIEHS) of the National Institutes of Health (NIH). The content is solely the responsibility of the principal investigator and does not necessarily represent the official view of the NIEHS or the NIH. Early breast cancer detection can significantly improve survival rates. However, current diagnostic tests expose women to the potentially harmful effects of radiation – and often fail to detect cancer in the earliest stages. A team of researchers from Georgia Tech, Emory University and the University of Ulm in Germany are using a portable, non-invasive device to determine which biomarker gases exhaled in a person’s breath indicate the presence of breast cancer. Breath biomarkers are volatile organic compounds originating in the lower lungs. Certain compounds are related to oxidative stress, the body’s response to inflammation, and are often an indication of disease. As a patient breathes into the device, these compounds are trapped and examined by a sensor. The researchers’ sensing methodology combines gas chromatography – a technique for separating complex compounds – with mass spectrometry, which identifies the chemical makeup of a substance. Specific patterns in the compounds are then found and used to confirm the presence or absence of the disease. The team recently conducted a clinical study analyzing more than 300 volatile organic compounds in breath samples of 20 healthy women over the age of 40 and 20 women recently diagnosed with stage II-IV breast cancer and who had not received treatment. The results showed that the breath analysis was able to determine whether the sample came from a cancer patient or healthy subject 78 percent of the time. The researchers are currently adding to their clinical database of breath data and trying to determine which compounds are most important for detecting breast cancer. That could help reduce the number of compounds tested. Because it can offer immediate results right in a physician’s office, Bayer expects the device will help increase early detection among those who do not have the resources for a mammogram, more easily conduct interval testing for those with a genetically high risk for breast cancer, and facilitate recurrence testing after breast cancer treatment. Other researchers involved in this project include Brani Vidakovic, a professor in the Wallace H. Coulter Department of Biomedical Engineering at Georgia Tech and Emory University; Sheryl G.A. Gabram, a professor of surgery in the Division of Surgical Oncology at Emory University; and University of Ulm professor Boris Mizaikoff. Scientists at Georgia Tech are using patterns of metabolites found in a drop of blood to detect ovarian cancer. Using an analytical technique called mass spectrometry, the researchers have been able to differentiate between serum samples taken from patients with ovarian cancer and those from unaffected individuals. “Ovarian cancer is the fourth leading cause of death in women, but it is a relatively rare cancer, so a functionally useful diagnostic test has to be 99 percent accurate or you are going to get too many false positives,” says John McDonald, chief scientist of the Ovarian Cancer Institute and associate dean for biology development in the School of Biology. McDonald teamed with mass spectrometry expert Facundo Fernandez, an associate professor in the Georgia Tech School of Chemistry and Biochemistry, to sort molecules in the serum based on their weight and electrical charge. “We focused on metabolites as opposed to proteins or peptides because we get better quantification and higher resolution for the smaller molecules that comprise the human metabolome,” explains Fernandez. With the help of Alexander Gray, an assistant professor in the Georgia Tech College of Computing’s Computational Science and Engineering Division, the research team was able to detect patterns of key metabolites in the blood. Using a sophisticated artificial intelligence computer program, they were able to “train” the computer to distinguish patterns of small metabolites found in the blood of cancer patients from those of control subjects. The scientists first used serum samples from known cancer patients and unaffected individuals to establish metabolomic patterns that were present at different levels in the two groups. The machine learning program identified a pattern consisting of only a few dozen metabolites, among thousands of candidates, which could be used to distinguish between women with ovarian cancer and women with non-cancerous conditions. Once these patterns were identified, the researchers tested the patterns of the same metabolites in a different set of serum samples from other patients with and without cancer. The researchers identified the samples with 99 percent accuracy. The identity of the key metabolites and the role they may play in ovarian cancer is still under investigation, but the development of an accurate and reliable diagnostic test will save lives when combined with existing therapies, according to McDonald. “Another great thing about this approach is that it may be possible to extend it for the early detection of any type of cancer or any disease from a droplet of blood,” adds McDonald. This work is supported by the Ovarian Cancer Institute, Deborah Nash Harris Endowment Fund, the Ovarian Cycle Foundation and the Georgia Research Alliance VentureLab program. Robots are being used more frequently today in hospitals around the country. Many of these robots, like the one developed by Queen’s University associate professor Gabor Fichtinger to perform needle-based prostate biopsy and therapy procedures, require medical images to accurately guide the surgical tool to the desired target. “Magnetic resonance imaging enables real-time scanning of the needle from its insertion through the skin to contact with the target, but the difficulty lies in being able to develop algorithms that immediately display and analyze the images while the patient is in the imaging scanner,” says Allen Tannenbaum, who holds a joint appointment as the Julian Hightower Chair in the Georgia Tech School of Electrical and Computer Engineering and the Wallace H. Coulter Department of Biomedical Engineering at Georgia Tech and Emory University. To visualize the prostate in real-time during biopsy and radioactive seed-placement procedures, Tannenbaum and graduate student Yi Gao developed fast image segmentation and registration algorithms to locate the prostate in magnetic resonance images and correct for movement during the procedure. The algorithms have been integrated into the transrectal prostate magnetic resonance imaging module of Slicer3, an open-source surgical navigation software. Tannenbaum employed two methods to “extract” the prostate from the magnetic resonance images: a shape-based algorithm and a semi-automatic method. The shape-based algorithm required inputting manually segmented three-dimensional prostate images into an artificial intelligence program. Then, given a new image, the program was able to isolate the prostate from nearby structures. For the semiautomatic method, users selected points inside and outside of the prostate and the program used that information to decide whether a pixel belonged to the organ or the background. In addition to segmentation, images of the same patient taken at different points in time require registration to cope with deformation of the organ. “Imagine you have a balloon – that’s the prostate – and you take a needle and push on the balloon. Pushing on it deforms the prostate and these changes have to be accounted for,” explains Tannenbaum. The prostate presents a number of difficulties for traditional image registration approaches because there are no easily discernable landmarks. However, because the surface of the prostate is almost half convex and half concave, Tannenbaum was able to capture the concave region in each image and use it to register the whole prostate. “Our segmentation and registration algorithms provide much greater accuracy for the robot to stick a needle in the prostate, while also requiring less than a second for computation and no special supercomputers,” adds Tannenbaum.